In this heraldic tapestry "Napolean Burgundy" we see a classic royal crest showing the eagle and bees of the Empire style. The images of the horn of plenty, where fruit bursts forth supports the central emblem of a crest with an eagle. The royal crown is at the apex. The eagle and the bee are symbols of the first and second empire. Napolean was proclaimed emperor in 1804 and he convened a session of the Conseil d'Etat to determine the new emblem for the empire. The bees were to represent the head of France being like a hive to the bees, and were also a symbol of immortality, and is one of the oldest emblems of the sovereigns of France. On the top left we see the hand of justice and on the base of the central crest we see the 5 sided chain of the Légion d'honneur, a decoration for military and civil services . The eagle was associated with battle victories and the eagle was placed on top of the shaft of every flag in his army. 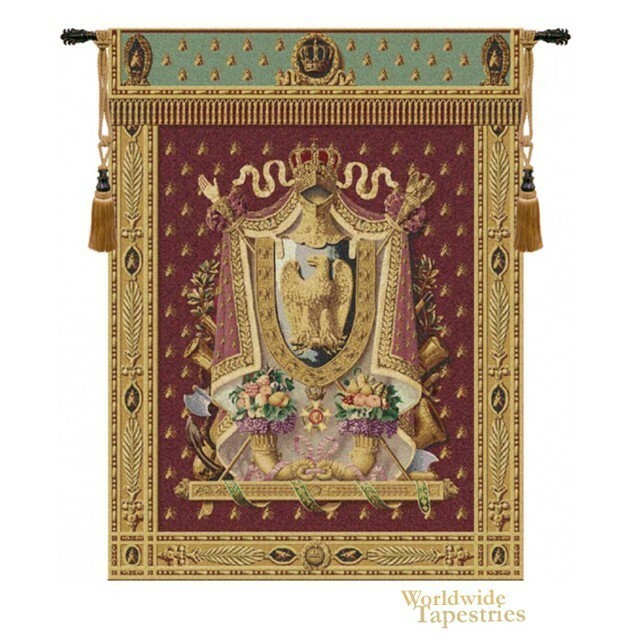 This royal crest coat of arms tapestry "Napolean Burgundy" is backed with a lining and has a tunnel for easy hanging. Note: tapestry rod and tassels, where pictured, are purchased separately. Dimensions: W 32" x H 44"